Originally it was a natural hollow part of the ground between the two hills of Agra and Ardettos, over the Ilissos river. 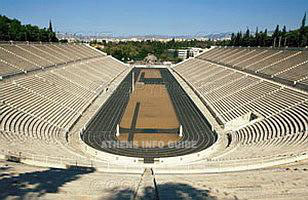 It was transformed into a stadium by Lykourgos in 330-329 BC for the athletic competitions of the Panathenaic Festival. Between 140 and 144 AD, Herodes Atticus restored the stadium, giving it the form that was found at the 1870 excavation: the horseshoe construction with a track 204,07 meters long and 33,35 meters wide. It is believed that the stadium had a seating capacity of 50.000 people. Another portico was placed in the stadium's facade. Herodes possibly also restored the Ilissos river bridge on the stadium's entrance, making it larger and adding three archways on its base. The bridge was standing there up to 1778 and a part of it was excavated in 1958. During Roman times, the stadium was used as an arena, with the addition of a semi-circular wall on the north that was corresponding to the sphendone of the southern side. The modern times restoration of the stadium was conducted by the end of the 19th century for the first Olympic Games that were reborn again in 1896. In 2003-2004, the stadium was restored again and the square in front was completely renewed in preparation for the Athens 2004 Olympic Games. The Panathenaic stadium holds a unique world record. On 4th April 1968, AEK Athens won the European Cup winners' Cup, beating Slavia Prague, in front of 60.000 spectators, the largest crowd ever to attend a basketball match. The Panathenaic stadium (in Greek: Panathinaiko stadio, meaning stadium of all the Athenians), is also known as Kallimarmaro which means "made of fine marble". When you are in Athens and especially when you're looking for directions, never call it Olympic stadium, as people will think you are talking about the modern Olympic stadium, in the northern suburbs. Also, try not to confuse it with the home ground of Panathinaikos FC, Apostolos Nikolaidis stadium also known as Leoforos. In short, call it either Panathenaic or Kallimarmaro and people will know what you are talking about.